Ancient Tech or Time Travel? | Screwing with the Past Another 300 Million Year Old Out Of Place Artefact? There are a great deal of archaeological anomalies which the mainstream scientific community has failed to bring to light. This of course is do to a program of obfuscation by our would-be masters, the goal of which is to promulgate a false history (his story) in which humanity is nothing but a cosmic accident in a cruel and chaotic universe. Once one considers all of the data available, a much different picture develops. The concept of time on earth has also been greatly manipulated, whereby we are led to believe it is a linear progression from point a to point b, a constant flow of 1 dimensional time. Reciprocal Systems Theory, which is the most accurate physical theory I have personally come across, describes time differently. That there are 2 regions or sectors to the universe, one where we live called space time and another etheric or beyond material sector called time space. When material is vibrated beyond the speed of light it crosses this barrier into time space, and can traverse the 3 dimensions of time with ease. We have described this concept several times on this blog as it relates to mind. David Wilcock also described in his book The Source Field Investigations, a strange phenomenon of living frogs encased in lime stone. Here is an example of what I have come to understand as a living organism moving its body into the time space sector. While to us our atoms and body appear to be solid and unmoving, the particles (or more accurately stated motions) of these atoms is near to the speed of light. Living systems are coherent enough to cause energy from the local environment to entrain onto an organism, pushing its material beyond the speed of light into time-space. When this occurs the body appears to be 'hard as stone' and can remain dormant for thousands if not millions of years. Additionally there are countless channeled and insider works which suggest that time is much more fluid and dynamic then we have been led to believe. The following article could be one example of technology from another time, re-entering space time and solidifying into a solid piece of rock. Much like the infamous philadelphia experiment. Unfortunately the amount of data available to confirm this hypothesis is elusive, but there is more evidence to suggest the aforementioned is accurate vs the accepted theory of unidirectional time and impossibility of traveling through it. The scientific community of course refuses to consider the likelihood of the object being technological and claims it is nothing more than a sea creature known as a Stalked Crinoid. If this is the case why have they made it so difficult to determine the material makeup of the object in question. Would it not be easier to simply do the material analysis and put wild claims to rest? I think anyone with an inquisitive nature can see the duplicity of this argument, and when one compares the object in question to the fossilized remains of the Stalked Crinoid, there are major discrepancies. Those who are brave enough to think for themselves and contemplate the data will find it far more likely that this is one more example of paradigm shattering technology, leading us to question the accepted myths of our origins. Those who are still hooked on the beliefs of modern society will blow this off as conspiracy theory. Thankfully the truth cares not for the opinions of men, laying dormant for us to develop the eyes to see. There are numerous archaeological discoveries that science cannot understand, we have come across countless findings that have ended up as being just that, findings that have caught the attention of researchers, but have yet to be accurately explained. In this case we have a screw that according to researchers is 300 million years old, and like many awkward discoveries in the past, it was found in Russia in the ‘90s. Russian scientists found it by chance actually, as they were performing analysis after the fall of a meteorite in the Kaluga region when they came across a mysterious object that resembled a modern day screw. Scientists were baffled and did not know what to think of it. Did it come from space? Is this screw proof of ancient civilizations that inhabited Earth millions of years ago? What is it? The fossil surrounding the screw has around 2 cm long. It was discovered in a scientific expedition that was performed by a group called the Kosmopoisk group, which is a scientific research group responsible for conducting UFO related research, cryptozoological research and paranormal science. Initially they suited up and went to search for the remains of the meteorite that impacted the Kaluga region in Russia. Suddenly, they came across the screw, and incredibly, after paleontological analysis, it turned out that the age of the "stone" was somewhere between 300 and 320 million years. The artifact was analyzed using X-Ray technology, which provided researchers with another shock; it turned out that another screw was present inside it. Many scientists have tried explaining the origin and details of the "screw", some have proposed that it could be the remains of a Crinoids (Marine animals that make up the class Crinoidea of the echinoderms) This theory was discarded due to the fact that the screw is much larger than the average size of these animals. The theories as to what this object is are pillage up. Skeptics are having a field day and they love to debunk discoveries like this one, offering a much simpler answer, suggesting that its nothing, probably the remains of an old factory, vehicle, or anything else that can make you, the reader look elsewhere for answers, without paying much attention to details such as the age, and region where it was found. So what is it? 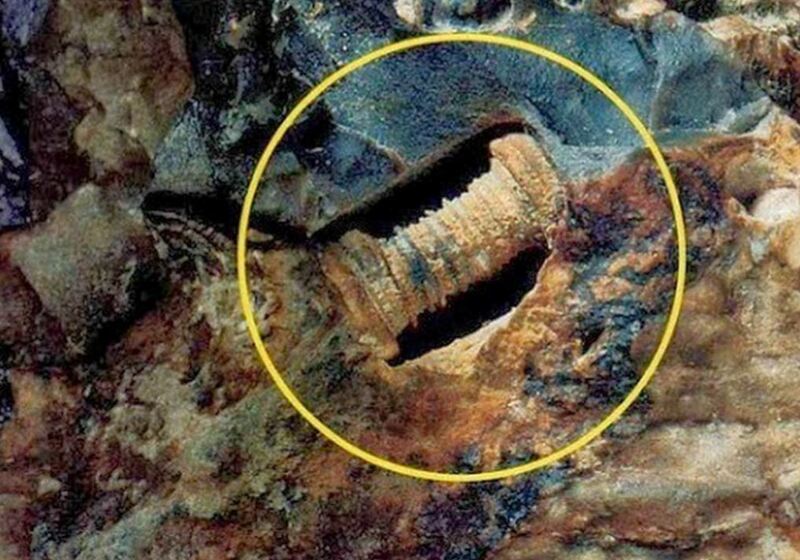 A screw that proves that extraterrestrial life was present on Earth millions of years ago? Is this screw the remains of an extraterrestrial vehicle? Or is there a possibility that it might just be evidence of ancient civilizations in the past that possessed very advanced technology? All of these options are still possibilities as we still do not know what this mysterious artifact really is. How is it possible that a screw could have survived a time lapse of 300 million years? What is its metallic composition? These are several of the questions that still need to be answered in order to get a full picture of what this object really is. In the meantime, let us know what you think this one might actually be. A Russian research team known as the Kosmopoisk Group, which investigates UFOs and paranormal activity, claims to have found a one-inch screw embedded inside a rock that is 300 million years old. 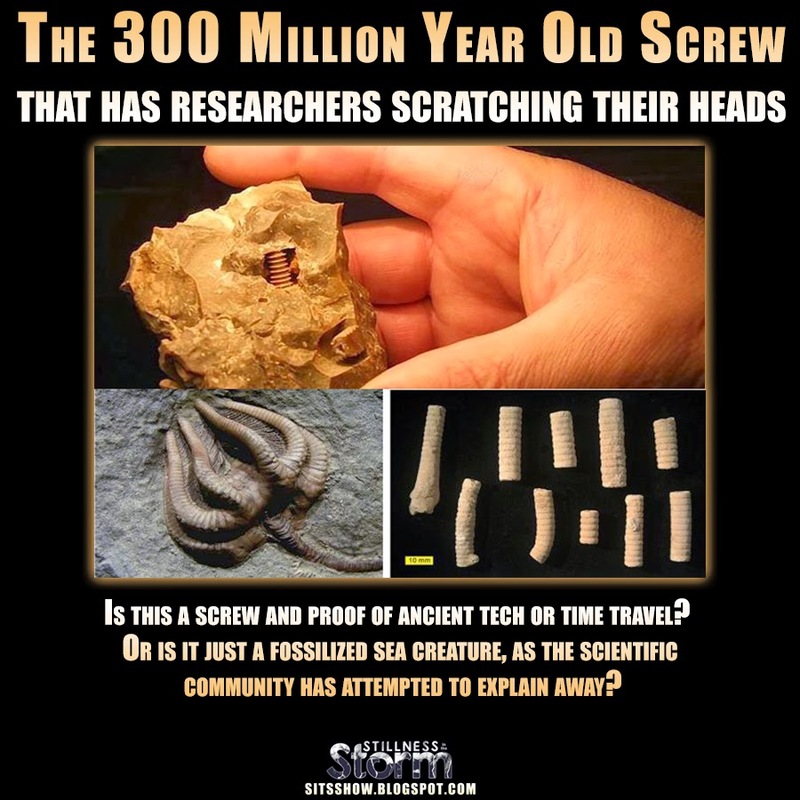 They say the screw is the remains of an ancient form of technology that proves extra-terrestrials visited Earth millions of years ago. However, scientists say the ‘screw’ is nothing more than a fossilized sea creature called a Crinoid. The Russian team were investigating the remains of a meteorite in the Kaluga region of Russia in the 1990s, when they came across the strange object. A paleontological analysis was carried out, which revealed the stone was formed between 300 and 320 million years ago. The team also claim that an x-ray of the stone shows that another screw is present inside it. However, they have not allowed international experts to examine the object, nor have they revealed what the screw is made of. Since the initial finding, much debate has surrounded the discovery, with scientists scoffing at the suggestion that it reflects an ancient screw and suggesting there is a much less exciting explanation. The Mail Online reports that scientists who have examined photographic evidence of the object say that there is a more earthly answer to the phenomenon – the ‘screw’ is actually the fossilized remains of an ancient sea creature known as a crinoid. Crinoids are a species of marine animal that are believed to have evolved around 350 million years ago. They are characterized by a mouth on the top surface that is surrounded by feeding arms. 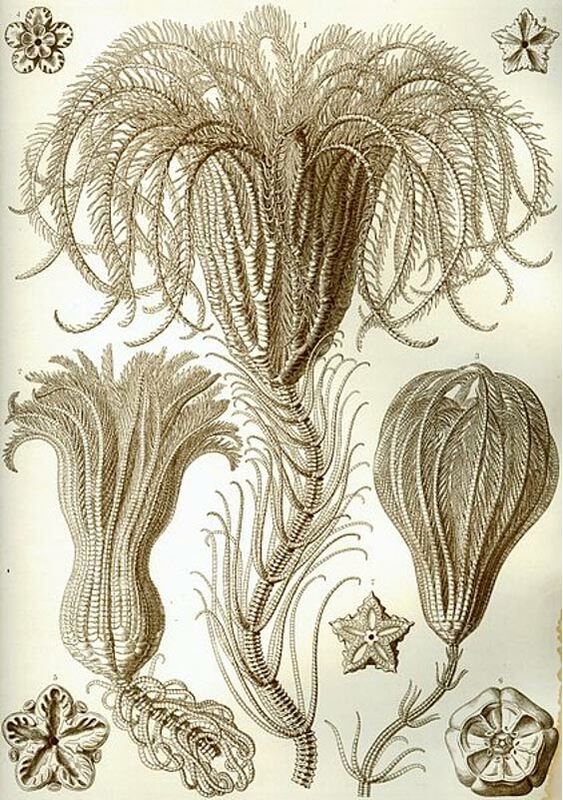 Today, there are around 600 crinoid species, but they were much more abundant and diverse in the past. Over the years, geologists have found countless fossils representing whole crinoids or their segments, some of which do resemble screws. Scientists have suggested that the screw-like shape seen in fossil samples may be the reversed-shape of the creature, which dissolved while the rock was shaped around it. For now, the controversy surrounding the object remains very much alive, and unless the Kosmopoisk Group releases detailed information regarding the material of the ‘screw’, it is unlikely that consensus will be reached any time soon.